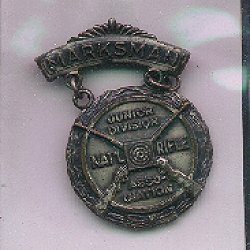 "1940's - Junior Marksman Medal - NRA." (1022) 1940's - Junior Marksman Medal - NRA. - Condition: Very Good. The Medal was presented by the National Rifle Association in the 1940's. The medal measures 1 1/4" by 2". Price: $8.00 + shipping.